It’s mid-August and America is as hot as a jungle right now, so it’s no surprise that we’re seeing an influx of wild animals across the nation. 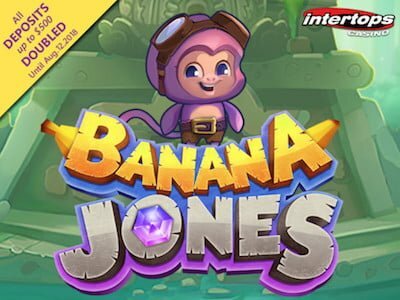 Queue up the cutest little monkey you’ve ever seen in your life who’s swung in to star in Banana Jones and is sure to make you say, “Awwww!” He’s arrived at the Intertops Casino for U.S. players and he’s brought a beefy 100% Match Bonus up to $500 with him – what a cheeky monkey! Now don’t be shocked when you load the game up because this little ape isn’t bringing you the traditional machine that you’re probably used do. Banana Jones Slots is based on the classic Snakes and Ladders board game that we’re all very familiar with from our childhoods that made us scream with delight and punch our siblings. He hops around on posts like Q-Bert in the hopes of triggering the colorful bonus wheel that’s filled with prizes, and there aren’t any standard game reels to speak of. All you have to do to try this crazy new game is deposit a minimum of $20 and then wager that and the bonus amount 30 times and you can withdraw all of your winnings. But you’d better get swinging though because this bonus expires on August 31st, 2018. The generous marketing team over at Intertops didn’t stop with Mr. Jones’ cute face however, and August sees Crystal Waters as their “Slot of the Month” offering free spins to players across the United States. This is more like the traditional machines that you’ll be used to with 5 dazzling reels filled with Caribbean underwater themes that will transport you right to the beaches of Antigua. In addition to a fat 150% Match Bonus you’ll also get 60 free spins for Crystal Waters by entering promo code TROPICALFUN when you make a deposit of $20 or more. Grab your diving mask and flippers because there’s one more aquatic offer to cash-in on there thanks to Megaquarium Slots giving you 22 no deposit free spins until the end of August. Simply go to the machine and enter promo code PRIZEPEARL to get the gratis games added to your account and start freerolling. What a great way to close out the summer of 2018! The weather has been hot but these promotions are hotter, so swing on over to the Intertops Casino and start checking out the action today.